The Department of Agriculture has only had seven Secretaries of Agriculture, a cabinet level position: Alva Agee, William B. Duryee, Willard H. Allen, Phillip Alampi, Arthur Brown, Charles M. Kuperus and Douglas H. Fisher. Secretary Fisher began his tenure in 2009. Agriculture has changed quite a bit since 1916. During that time period, 53.5 percent of New Jersey’s land was dedicated to farming. There were 33,487 farms on 2,573,857 acres. The major agriculture sector was the dairy industry, with 3,500 dairy farms. Much of New Jersey’s agriculture centered around grain and forage crops needed to supply the dairy herds. Fruits and vegetables were important, grown mainly near to the New York and Philadelphia markets. Significant crops at that time were apples, asparagus, peaches and white potatoes. Now, there are 9,100 farms on 720,000 acres with annual sales of more than a billion dollars and ranking in the top 10 nationally in the production of clams, scallops, cranberries, bell peppers, spinach, peaches, blueberries, cucumbers, lobster, snap beans, squash, cabbage, and tomatoes. The largest agriculture sector is horticulture, followed by fruits and vegetables. Several of the top crops are blueberries, tomatoes, bell peppers and peaches. The Department’s mission has expanded from support of farmers to now include animal and plant health protection, and feeding school children, pre-school children, the elderly and the hungry. Agricultural education, protection of soil and water resources and farmland preservation also are provided by the Department. 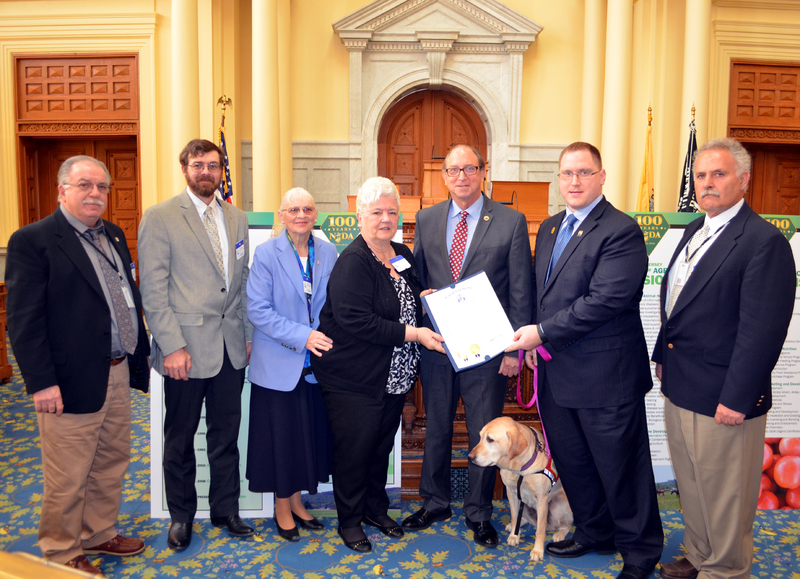 Some of the Department’s major accomplishments over the last century include: the Farmland Preservation Act, which has thus far allowed for the permanent preservation of more than 200,000 acres of farmland; the Jersey Fresh Quality Grading and Promotion program, the first state agricultural branding program in the nation; the Phillip Alampi Beneficial Insect Laboratory, which raised insects to combat invasive species resulting in the need for less pesticides; the Jersey Seafood and Jersey Grown promotional programs; USDA accreditation to conduct organic certification; Made with Jersey Fresh program to allow processed foods made with NJ agriculture products to label their products as such; and Jersey Fresh Farm to School program, including New Jersey produce in school meals.